and praise for this are my own. It is time for another create and share collaboration! 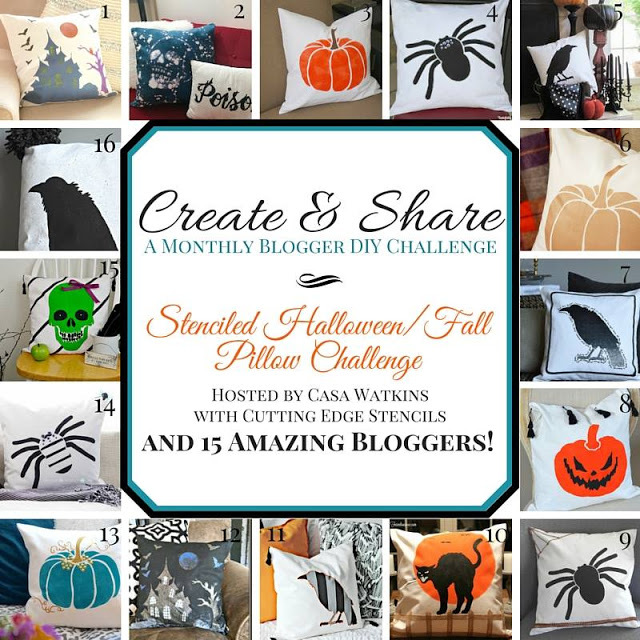 This time there is a group of 16 bloggers getting creative for fall and Halloween. The create & share crew teamed up with Cutting edge stencils to bring this project to you all. Along with the fun, creative and unique ways we all used the stencil. 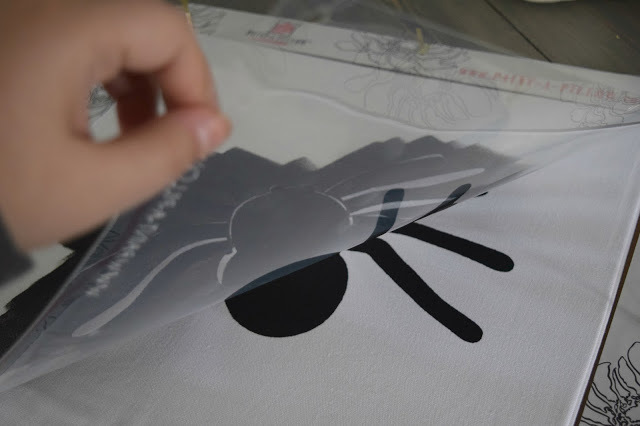 Sharing the process for you all, there is also going to be 3 lucky winners who get a stencil of their choice. 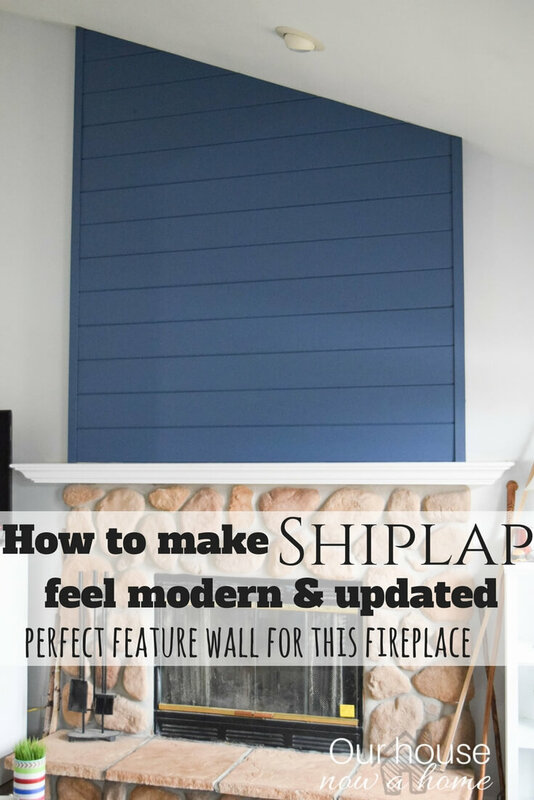 A DIY challenge with a ton of inspiration and a giveaway, whaaaat?!!! This is a double whammy of awesome. Just saying! I was blown away when I saw what everyone else came up with. We were all determined to put our own little flair to this pillow challenge. With cutting edge stencil providing us all a similar stencil we knew we needed to shake things up with accessories. I had such a hard time coming up with a plan to make this feel more me. I was still figuring out the details of my plan when I got my kit in the mail. 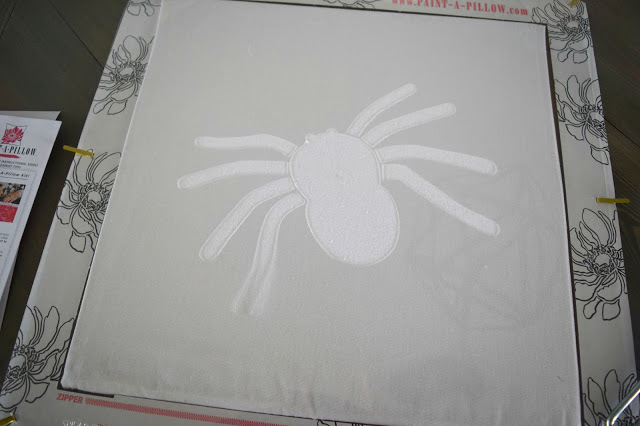 This was my first time using the paint a pillow stencil from cutting edge stencil. Really, I am not usually a stenciling person. I adore the look, I just never seem to use stencils. I am converted person. This kit came with everything. It came with the pillow sham situated, attached and ready to go for the stencil. It came with a pillow, painted, brush, roller, tassels. I decided not to use the tassels. It also came with really thorough instructions. Talk about easy, they took all of the work out of this. 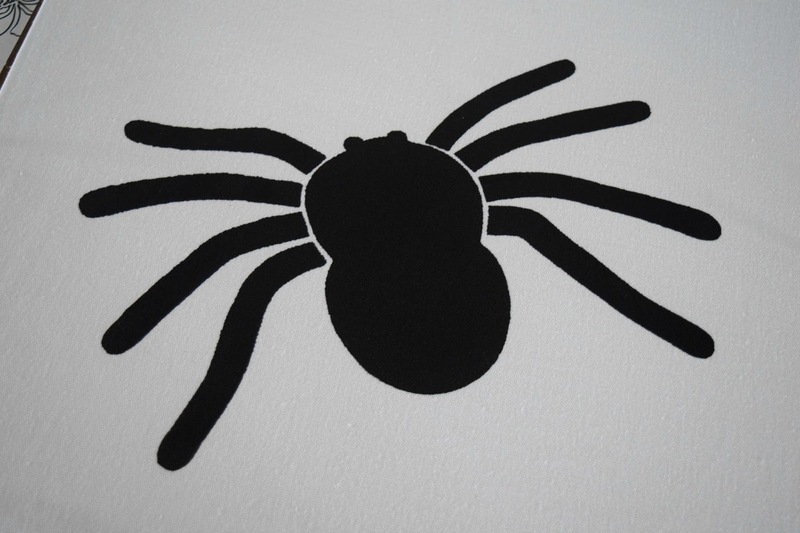 I picked the spider because you cannot get anymore spooky then a spider. Real talk, i real life if ai see a spider I sort of freak out. You know those videos on the internet of people tapping one spider and a bazillion pop out of it? I scream, hyperventilate and loose my mind. Dale likes to show me these videos for fun. Relationship goals. 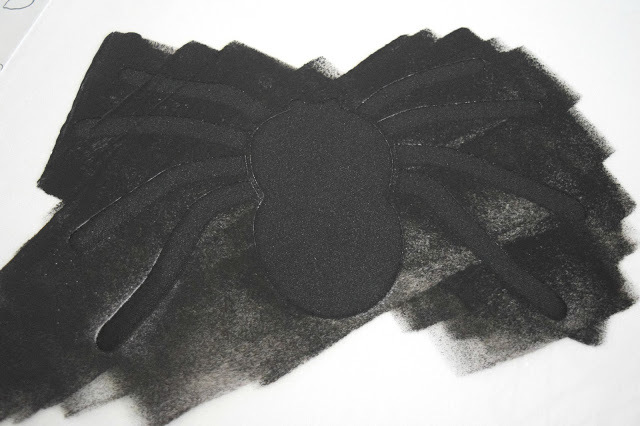 However, a big, juicy, FAKE spider for Halloween decor is my favorite. 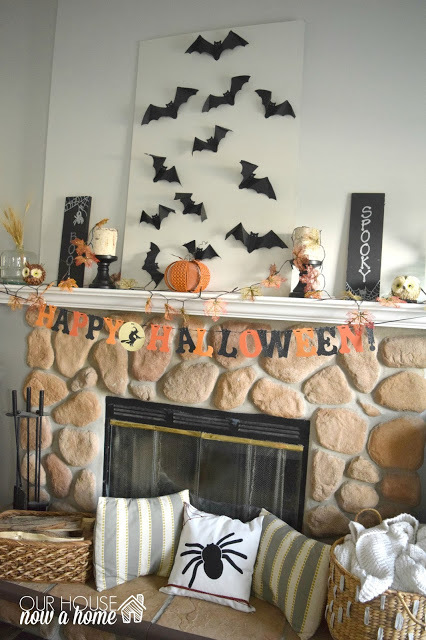 Cutting edge stencils made this so simple. The spider was already situated in the center of the pillow case, I needed to do nothing but paint it. The roller that came with the stencil was easy to use. I globbed on the black paint, also provided. I rolled the paint over the stencil. In the instructions it says to put light pressure on the roller. 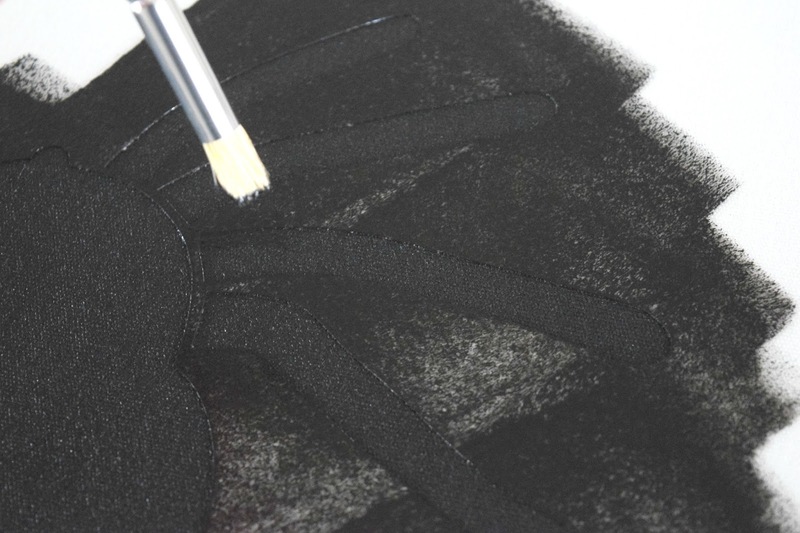 If you put too much the paint can seep through into the non-stenciled side. I did not have that problem but I took their word for it and listened to the steps. I also was not too cautious on the direction of the roller, just rolling it in every direction. It did not seem to make a difference in the end. The kit also came with a small brush. 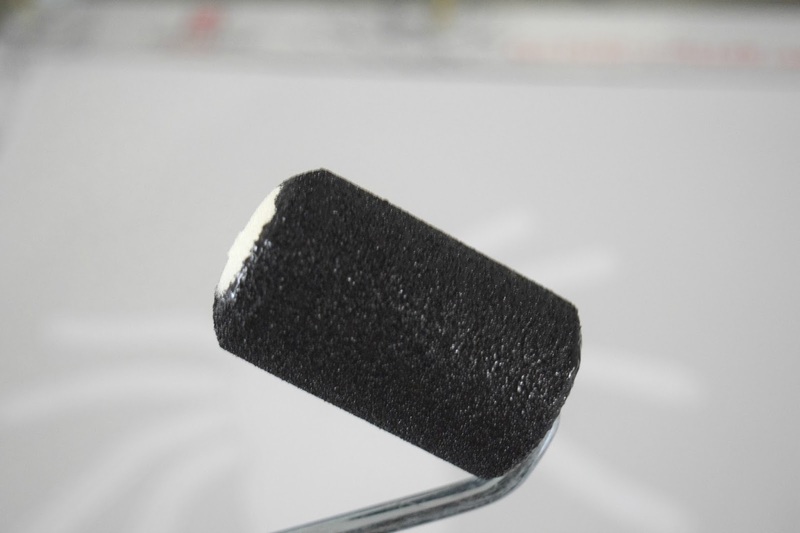 This was used to touch up any edges that the roller did not get. I had a few spots that looked a little less done. Using this was also simple. I blotted the brush onto the spots that needed to be touched up. Simple stuff. I did this whole project while Gavin was delaying going down for a nap. He was eating his lunch sooooo slow. So while he talked, stalled, and took the smallest bites known to man I did this simple stencil craft. Once I was done I was able to pull the stencil off. I was holding my breath with me never doing this before and not being a stencil pro I was worried about the results. I should have known it would come out good. It was perfect! I can say that and not feel weird. What I did was not perfect. The stencil kit literally made it the easiest thing ever and impossible to mess up. The drying time was super fast as well. I painted it, took the stencil off, read Gavin one story and put him down for a nap. I came back and it was almost dry. That is quick in painting world. Now comes the hard part. I needed to make this be different. I knew there was some other people from the group who also chose the spider, so it was game time. I needed to bring it, because they would be saying “oh it has already been brought’n.” (quick, what movie is that from?). I found this string in the dollar section at Target. By the way, that section is the best and worst part of Target. I cannot seem to stop there on the way inside the store. And I always end yup with something. Sometimes a lot of somethings. I justify it as only being $1, some $3. However, a pile of low price still adds up. This purchase was a good one. 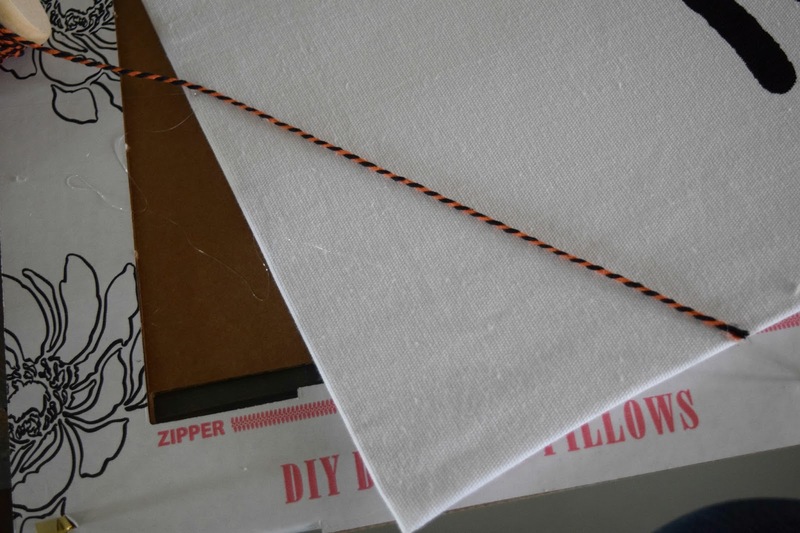 This perfectly Halloween colored string worked. Using a little bit of hot glue I put row after row of string on the bottom of the pillow. Just on the edges. This is most likely not washer safe, or kid safe if you have ones that pick at things. This pillow is going to sit on the fireplace ledge. Not too much traffic at all. So the strings will be safe. I liked the look of the lines of string on the bottom but felt it needed a little something more. I decided to make a spiderweb in one corner. It was done! I wanted to keep the focus on the spider, and have only small additions to this. 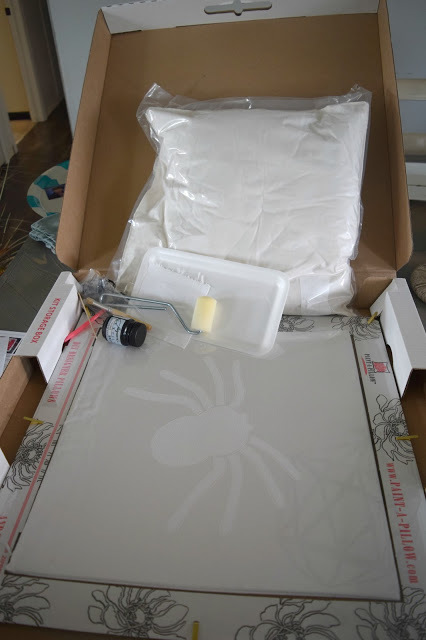 I loved the oversize spider on the crisp white pillow. So the string is just a small accent. 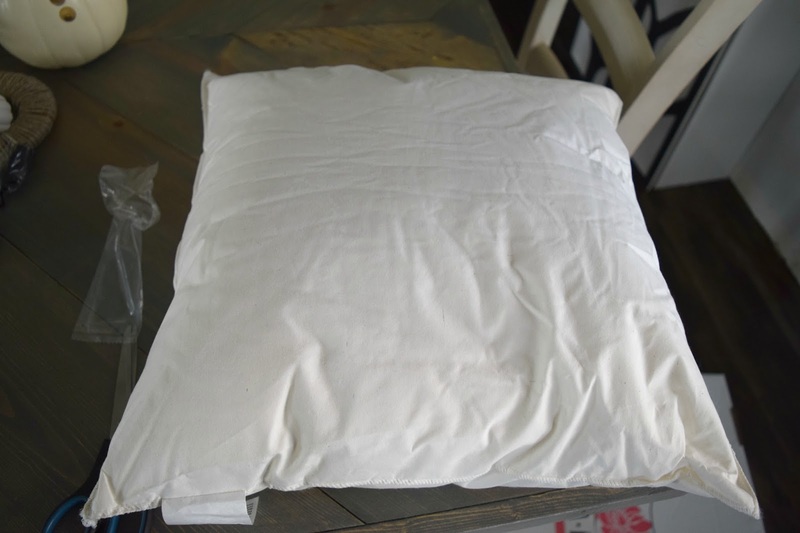 This is the pillow that came with it. This pillow is super soft and fluffy. I put the pillow into the pillow sham and zipped it up. That is another nice feature, the pillow has a zipper, which makes it be able to last longer. 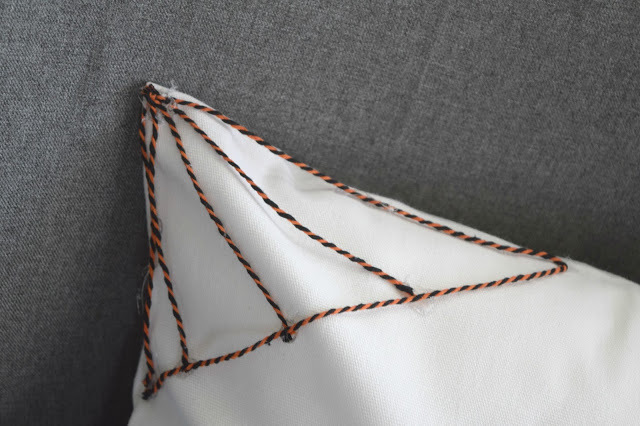 A zipper will protect the pillow and help keep it looking better for longer. The pillow was done, in one afternoon! I love projects like this. I have a great pillow to add to my home and bring out the Halloween fun, and it was not a difficult project to do. The small spiderweb was just what was needed to make this feel more polished and done. I used such small amounts of hot glue that they are barely noticeable. Which is good because hot glue has a tendency to get sticky hard and messy. But using is sparingly like I did helps that not be an issue. 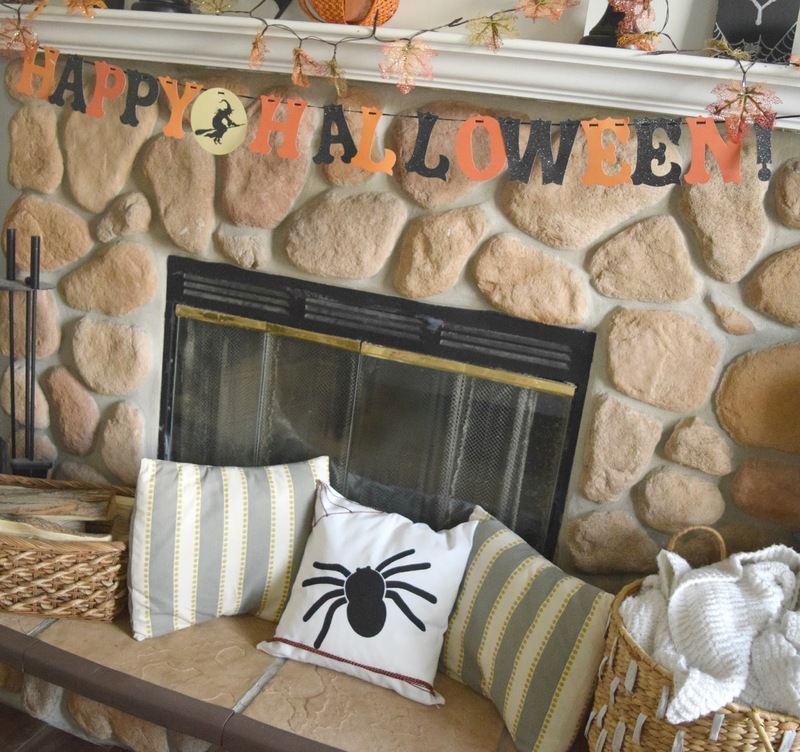 I decided the pillow looked lonely in my study, so it resides in the middle of my Halloween eccentric fireplace decor. Happy Halloween is right! Is it possible for spiders to be cute? Like I said, I am beyond afraid of spiders in real life. 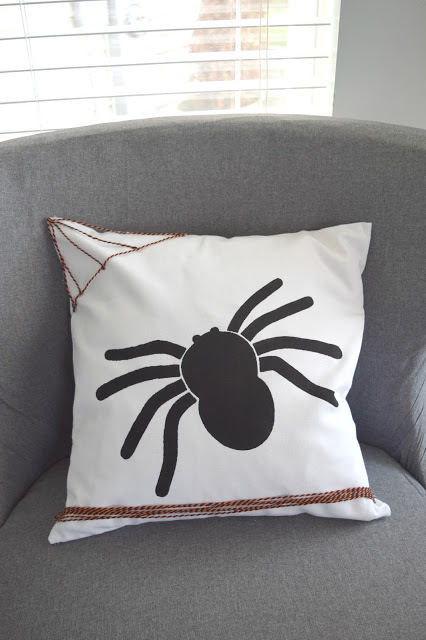 But cute, fluffy pillows with spiders I can do. This one fits the bill perfectly! This stencil was amazing and something I will be keeping in mind for my next stencil project. The pillow one was beyond easy to do. If you are interested in finding out for yourself you can enter below or go to their site here to see all they have to offer. Be sure to visit all of the other bloggers who joined in this months challenge. They all have some different ways they used these stencils. 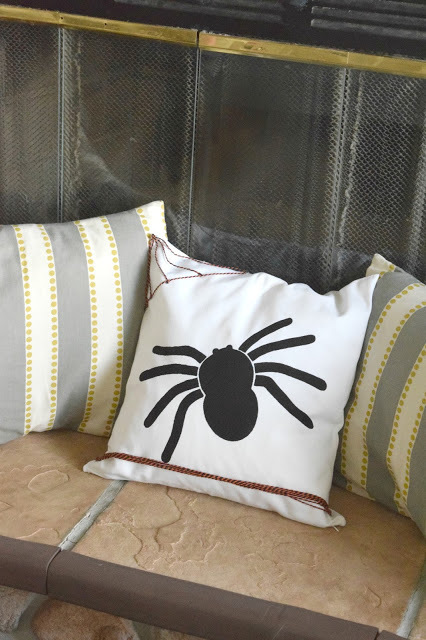 If you loved these creative stenciled pillows, you can now make your own! Enter our giveaway for your chance to be 1 of 3 winners of a Cutting Edge Stencil or Paint-a-Pillow kit of your choice valued up to $50! 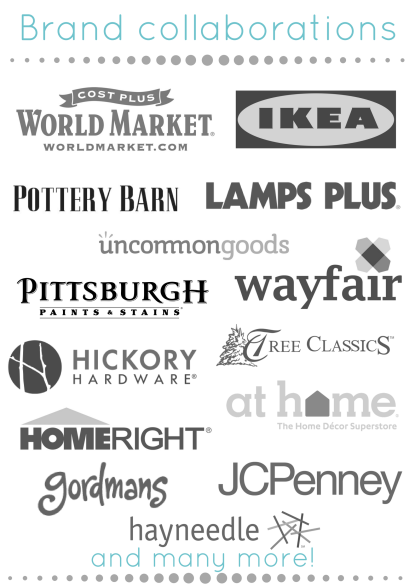 Scroll down for even more chances to win. Emily, the added touches with the string is so perfect! Great job! This is fantastic! 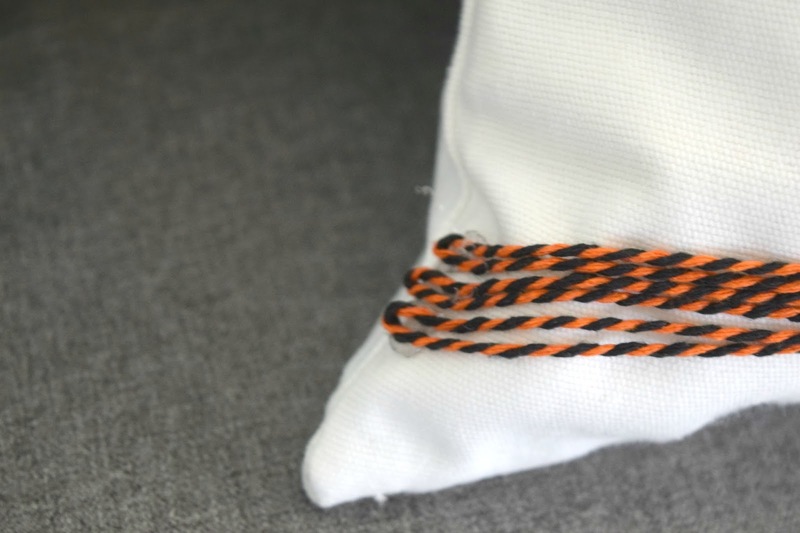 It looks amazing and the orange and black string really works. Well done! Thank you, I thought the string would work well with it! Oh my gosh this is so cute! I think the spider web in the corner really does make the pillow look more complete. Blown away by the talent of everyone and their pillows! Thank you! They all turned out so well and creative! Love that little spider web, what a great added touch! 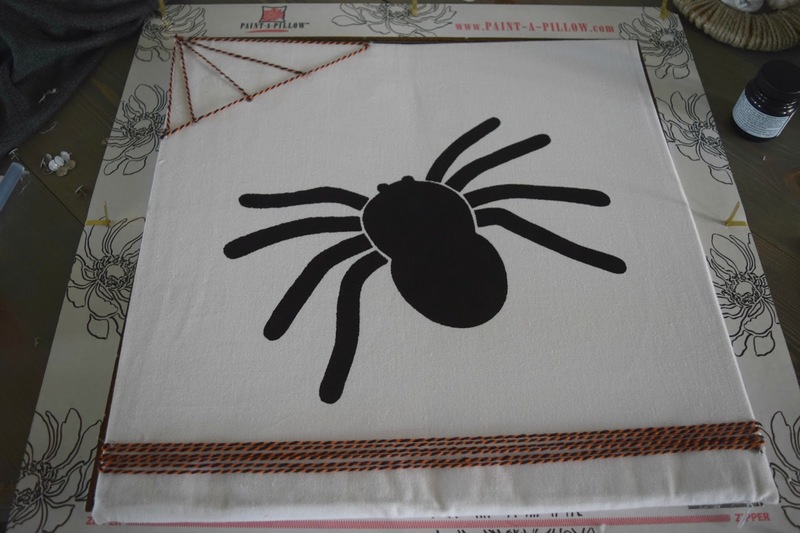 I love how you added the string to the bottom and to make the spider web! The orange and black is just the right pop of color and it flows really well with your Halloween mantle. Great job Emily!! Thank you so much Sydney! Emily what a fun way to add a little something but using the string! Love the colors with the spider! Great job! Thank you so much, the string was a great way to give it a little something. I love the addition of the baker's twine! And I can't believe what a clean line you got under the stencil, that's amazing! Thank you, that stencil and the kit is what made is so precise. It would be tough to mess this up. Oh my gosh this is such a cute pillow!! 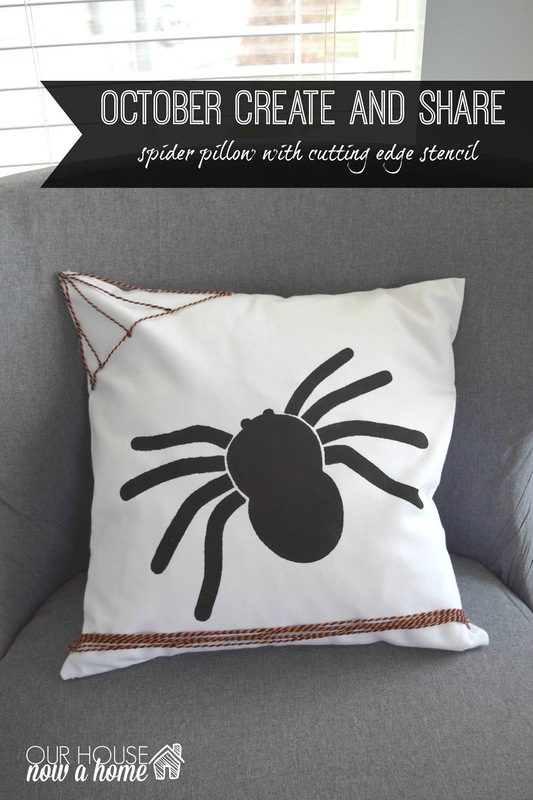 I never thought to use stencils on a pillow like this for a craft what a great idea! Thank you! This was my first time stenciling a pillow and I am hooked! This is so cute! I love the spider web in the corner! That almost makes me like spiders! 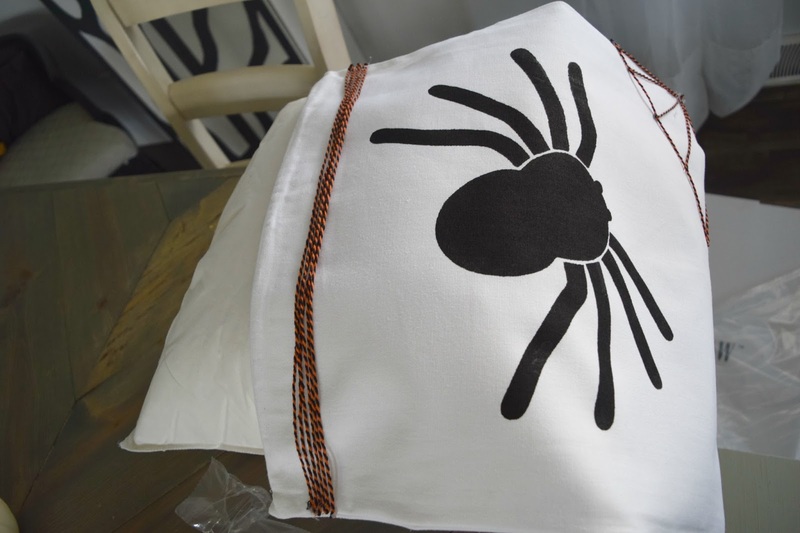 It is really cute and your spiderweb was a perfect addition to your pillow. I am right there with you, cute fake spiders I can do. Real ones, no way!!! What a cute little pillow. I love the addition of the thread for a web in the corner. Gives it just the right amount of color. Bonus points for working in Not Another Teen Movie. Thank you! I am so happy someone got the joke. I was worried people would just think I have horrible grammar. It still seemed to funny to not put in. If I had not read what you wrote and knew you made this yourself I'd guess it was machine made! It's just perfect. What a fun project. Wow, thank you so much! 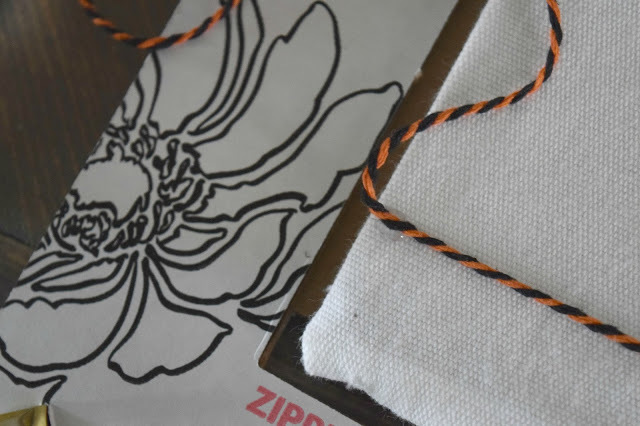 The stencil kit made it really simple and easy. This was my first time stenciling a pillow and it was the kit that made it come out so well. Looks awesome. I especially love the pillow. Spook-tacular!! What a great crafty project. 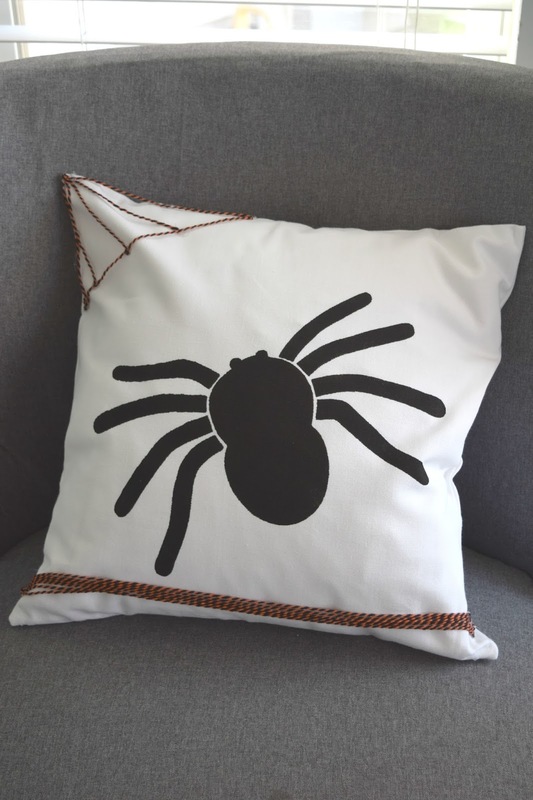 I actaully like spiders so this would be a great pillow for my sofa. Thank you! I do not like real spiders, the fake kind I am all about. That pillow looks fabulous. 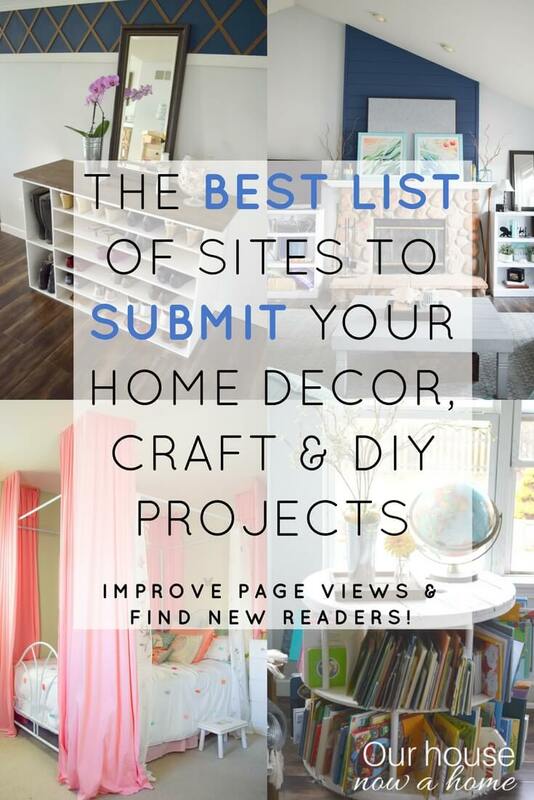 You are quite the crafty person! 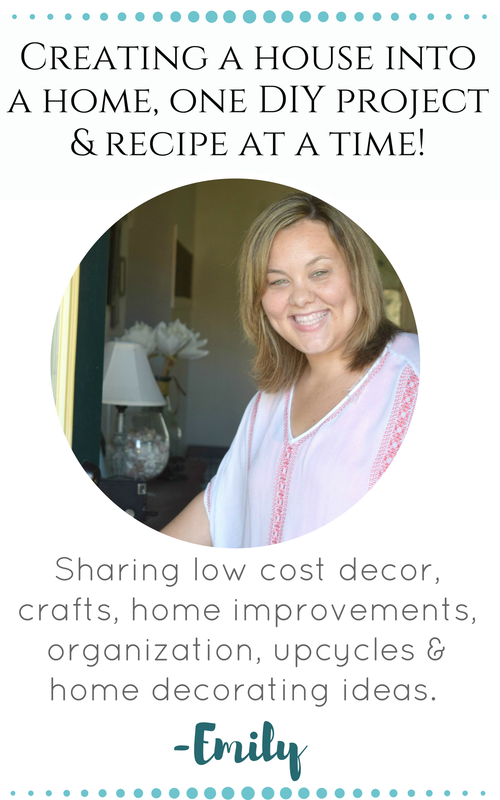 Thank you, I do enjoy creating things and getting my craft on! Such a great idea. And the result is perfect. Congrats! Thank you! This kit spoiled me, it came with everything I needed. So simple! 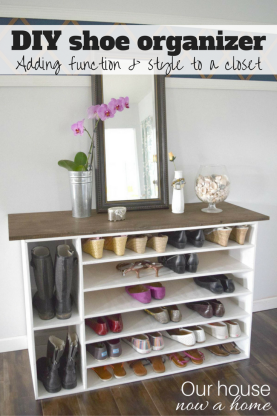 What a great idea to add the trim! I love the corner spiderweb detailing! This looks great! 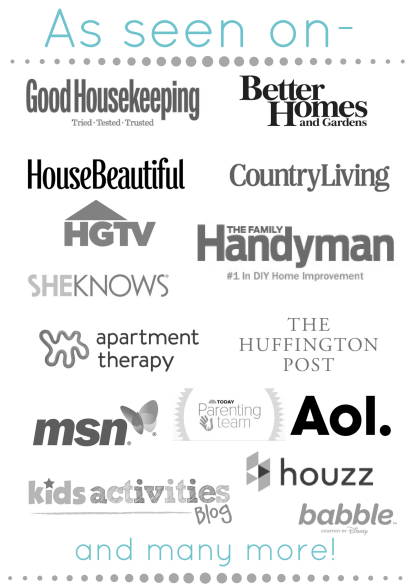 I love the Chrysanthemum stencil on the site. Oh, that stencil is so pretty! I love what you did with the pillow Emily, the string is such a great idea and the perfect touch! Thank you so much Stephanie, also thank you for organizing this fun challenge! I love the festive string you added! Gosh, that $1 section is so addicting! Such a good/bad thing at the same time!